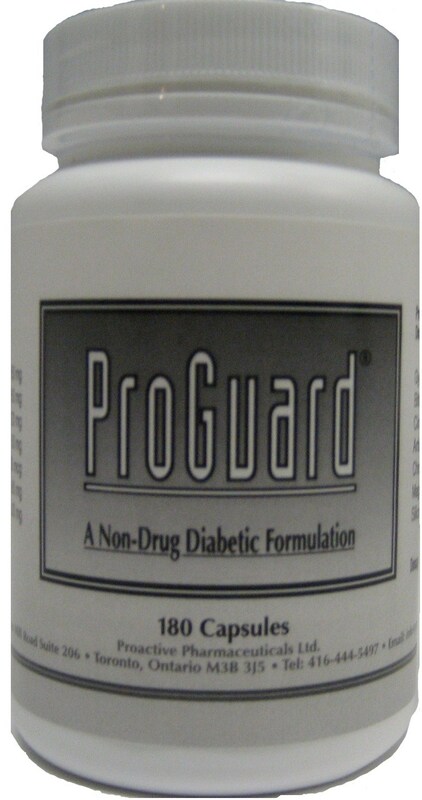 Proguard diabetic formula is a non-drug formulation that contains natural ingredients. Independant clinical studies have demonstrated that these ingredients promote healthy glucose levels. Gymnema Sylvestre Extrac 150mg 25% Gymnemic acid (leaf powder stimulates the heart and circulatory system. Used for antidiabetic activity. Learn more). Bitter Melon Extract 3% Bitters 150mg (stimulates digestion and regulates fuel metabolism. Learn more). Cinnamon Bark Extrac 10% Polyphenols 120mg (increases glucose removal from the blood, lowers lipids and functions as an antioxidant. Learn more. Artichoke Leaf Extract 5% Cynarin 50mg (stimulates the appetite and increases the flow of saliva and digestive juices. It also cleanses the liver and lowers lipid levels. Anti-inflammatory, anti-oxidant and anti-cancer properties. Learn more). Chromium from Chromium Polynicotinate 100mcg (lowers serum cholesterol and glucose. Learn more). Dosage 2 capsules three times per day before meals.